An elite flawlessly made three-way technology speaker system in a contemporary design. With this model we were able to achieve both vivacious high-end sound and elegant style. The SV-10's narrow profile is given additional emphasis by the side positioning of the high excursion subwoofer. This allows for a uncrowded placement in your sound system. 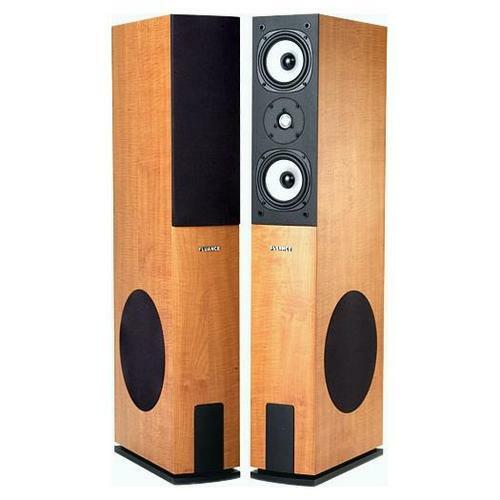 In the listening environment this speaker gives an exciting performance. With superb sound radiation and rich timbre, it converts the audio signal into incredibly wonderful music. It has top reproduction qualities in the hi-fidelity music as well as the surround sound home theater area. The SV-10 is vertically and horizontally braced internally to ensure that the acoustic image remains free from cabinet vibrations and driver resonances. Rock-solid MDF construction suppresses enclosure panel resonance for distortion-free, accurate response. By virtue of the tuned bass reflex cabinet with ports in the rear and the side-firing 8 inch subwoofer the SV-10 speakers have outstandingly brilliant and dynamic low frequency subsonic performance. 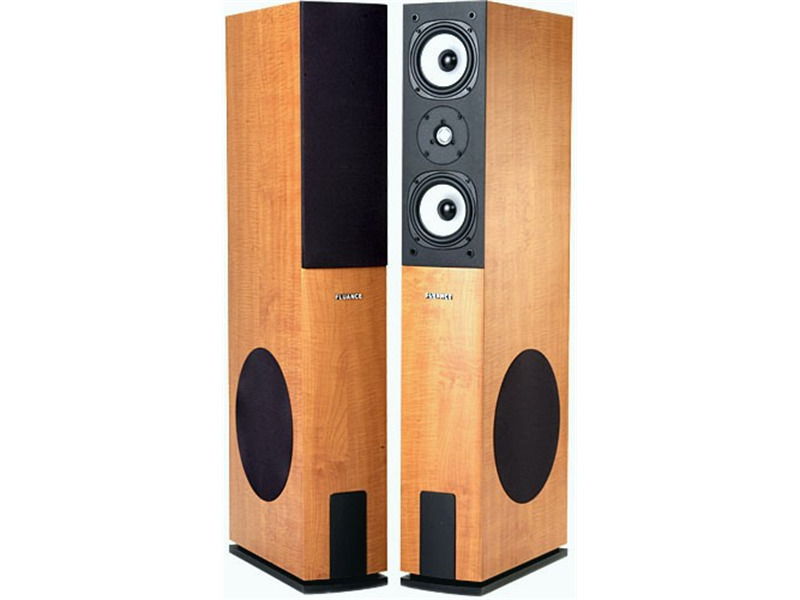 Only premium components such as powerfully dimensioned high-performance magnets and Neodymium tweeters are used in the production of this system. The Neodymium balanced pure silk dome tweeters provide a wonderfully smooth and accurate projection of the high frequency portions of the signal. The result is a pure and perfect listening experience. Thanks to its distinct design and trendy natural beech finish, it harmonizes perfectly with modern living areas. This is unmistakably a speaker system made by Fluance. The quality is ABSOLUTELY AMAZING! Buying a product of the same quality from a well known brand, (which is Klipsh_RF-82 in my case) I had to pay $550 for each speaker, while I paid only $400 for the set of exellent speakers. Even my friends-musicians couldn't find much difference between sound quality of Klipsch and Fluance. I would strongly recommend this product especially to those, who prefers classical music. Back when these speakers came out, I bought a pair. I'm a tinkerer and get bored with audio equipment rather easily. For years, I used Bookshelves on stands with a powered sub. (consider it pre-acoustimass system) So I sold my Missions for a set of NHT1.3's and they served me well for years. With a larger house and more space came room for larger speakers. But, who wants to spend an arm and a leg on something I know I will sell and have depreciated heavily in the future? So I looked around for a few months for something "fresh" in the <500.00 range. I was THIS close to buying ebay white van specials; as what I was primarily interested in was the build quality and attractiveness of the cabinets. This sounds odd....however, knowing that once I had a volume measurement inside, it would be simple to replace the drivers with quality vifas and make a matching crossover. So I emailed Fluance some very specific and technical questions about the sv10's. Wouldn't you know it, they answered every one, in detail. I bought a pair. Hated em! they didn't sound anything like the NHT's. I gave them a chance and got used to them. Turns out the NHT's were the speakers I didn't like! Ive since been to a friends with the same NHT's and I was grossly under powering them with a base model Sony ES receiver. My old dog receiver sounded pretty good with the Fluance, and I got used to them. With an Infinity il100s subwoofer, computer speakers can sound good. My new Denon amp arrived and these babies BLAST it out, without breaking up! I lived with these for a while, and was completely satisfied. Then my sub blew up. This gave me a chance to realize what I was missing or not missing with the 8" side firing speakers. i had to turn up the bass a bit to get them to thump, but they actually did thump! I was impressed. Blew up one of the woofers, and a call to Fluance solved that in less then 5 minutes. New woofer on the way, no charge. Overall I was totally satisfied . Ive owned these longer then any speaker Ive kept in my main listening area, and it was time for a change. but wait!..what if I played with these a little bit? Instead of replacing drivers, what if I kept the speakers EXACTLY as they were and see what I can do with them? Lets play with active crossovers and bi-amping! enter one Teac equalizer (think 80's),and a new AudioSource 200w dual mono amp. Total cost (thank you eBay) 110.00 for both. Now, I thought the 8" drivers were just cheap (they are), but after listening, hence the equalizer, I realized that they are crossed over too high for their location on the side of the cabinet. Now the equalizer is hooked to the AudioSource amp, and drive ONLY the 8" drivers. The EQ is set to resemble an upside down U removing everything over 2000hz, than climbing to the mid bass, and tapering off again at 250hz. The Sub is crossed at 80hz to pick up the rest. HOLY CRAP. I find myself inviting the neighbors over for beer and ear melting music at VERY high SPL's. I'm VERY happy. I'm keeping them for a few more years! I'm so happy with the results of EQ tuning, that I bought some Canare speaker cables..2 large braided garden hoses running to each speaker looks damn cool over a beer with your buddies. The bottom line is that for the money, I am completely satisfied, and I have a brand no one else has. Why conform to the norm! They were a good deal to me at retail. If you can find em for less then that, buy em! On a final note, when they stop sending me free replacement drivers, I will start replacing them with aftermarket ones. Just bought these from someone in Long Island and I only paid 75.00 pair. Even if it were not for that amazing deal I would still be more than happy with these speakers! I had a Sherwood receiver connected with 12 guage cable and then switched to my Harman. At first I thought the sound was mediocre with very subdued treble. With the proper power and room adjusments the speakers opened up and filled the room in stereo mode with unbelievable sound. Crystal clear and very powerful. Crossover points are near perfect and all program material from classical to hard rock shook the house. I have not yet bi-amped these speakers but will buy a reciever capable in the very near future. I replaced a pair of Polks and could not be happier. Also use JBL, Klipsch and ADS. Great sound reproduction. Good bass. I was surprised at the level of bass produced from a speaker system without a dedicated powered subwoofer. Very balanced sound. Good quality construction. Visually appealing. They can get really sound so that you will have short term hearing loss if you try. No distortion unless you raise the EQ to unnatural levels where bass gets bad. At a normal EQ these speakers will not distort at least as far as I've found. Highs are harsh before they are broken in, but smooth out a great deal after the break in period. Biwiring didnt make as much of a difference as I was hoping. The 8" woofer isn't exposed like the other speakers are so I cant see it thump, but now I'm just looking for weaknesses. I ordered the SV-10 along with the AV-SC center channel and the SX-6 bookshelf surrounds. The SV-10 are, to me, very impressive. I have them hooked up to an Onkyo 504 receiver with 75 watts per channel. I got these as an upgrade from a Logitech digital computer speaker system with 3" surrounds and a 10 in sub. Those were great for a while but I finally realized that the sound was unbalanced, so when I upgraded I decided to go all out with some of Fluance's higher end products. I've given them the 15-20 hour break in period. The highs are not too harsh, and sound very good. This is where I can tell a big difference from the other speakers I've used. The mids are pretty much dead on, giving just enough low midrange to have a small thump and enough high mid to make guitar riffs sound really good. The 8" woofers are quite impressive. Considering I'm going from a 188 watt powered 10" sub to 8" woofers from a 75 watt per channel receiver I was expecting bass to be a little lacking. Well I was wrong. While they aren't quite as room shaking and powerful at the 10" sub I'm used to, the bass is much more clean and tight sounding, not boomy. And whereas the other sub made a dead spot in the middle of the room where there wasnt much bass, the bass in the SV-10's fills up the room much better. The end result is a very balanced sound. Good lows considering there is no powered subwoofer. Good highs coming from the silk dome tweeters. Good mid ranges coming from the 5" mids. I also have them biwired but I didnt hear all that much of a difference. The speakers are very visually appealing and look very nice next to my entertainment center. They also have very good stereo imaging compared to what I'm used to. When listening to music and movie soundtracks you can really tell how the music was mixed into the right and left channels because some sound comes from one side and some comes from the experience. I use the speakers about 70% music and 30% movies. The music is almost exclusively rock. I've also tested them with rap although that's not what my usual listening is. With movies the sound is very immersive and the speakers manage to make the soundtrack and effects sound like they are coming from three feet to the outside of the speakers, which is a nice effect to me. I'm am not dissapointed in any sense with these speakers. I ordered Thursday, they shipped the next Thursday, I received them the Wednesday after that. They would have shipped faster but apparently they were out of stock except for one pair in their warehouse that they had to find. One speaker had a minor smudge/scratch on the top of it but I was notified by the customer service rep before they shipped them to make sure it would be ok with me, which it was. Turns out you cant even see the scratch unless you look at it with light reflecting on it just right. The shipping was good once they did ship. My only gripe is that no one called my or emailed my about the order not shipping or about them being out of stock until I sent them an email asking about the status of my order almost a week after ordering. Besides that they did a great job. Nothing similar really. I had a digital Logitech speakers system that was 500 watts RMS but these SV-10s arent even in the same class. the Logitechs are what I am comparing them to though, along with my uncle's Fluance AV-HTB system which my system trounces. as this is coming out the mouth of just an enthusiast. exceptional design...... exceptional components...... exceptional craftsmanship...... not to over-shadow the sounds that are coming out from these speakers !!! none...... as far as i am concerned !!! hello to the folks at fluance. from the design... to the assembly... to the sounds coming out of your speakers... combined with great care in handling with mercury-like delivery. thank you very much for producing such a great internet purchase experience !!! 1)Sonic perfection that leaves nothing to the imagination. A bit top heavy, the included floor spikes are a must on carpet. I have owned these speakers for just over three weeks now. I can honestly say, I have not heard speakers like these for any less that $1,000 each. Out of the box, these babies were spectacular! After about ten hours of break in, love is in the air. The cross over points are dead on, highs and lows are in sweet harmony. If bass is what you are after, The SV-10's pack a solid punch that certainly needs no help from an additional subwoofer. Others may pay more for a well know speaker brand, but only the smart few will purchase Fluance speakers. Player. All cables are Audioquest and Monster THX1000. I began searching for new suuround system by reading reviews on lesser known brand names. I came accross many Fluance reviews. I like others couldn't believe the positive reviews for the prices paid for their product. I bid and won a pair of SV-10's,3-AV-BP2's,1-AV-SC. I am very impressed with the SV-10's, I myself do not hesr the lack of low end from these speakers. I have the low end setting at a midway point on my receiver and it's enoungh to rattle the upstairs. Myself I don't need the heavy lows of say a Cerwin Vega and I do have a sub if needed. The clarity and crispness of these speakers is astounding. Though you can pay much more for speakers I do not feel the need and will spend my savings on other upgrades. Hope this helped someone who is considering the SV-10's. I don't think you can find any better value for money. I have read the other reviews and I concur with all of them. I have the SV10s, AVSC, and AVBP2. I don't have the stability problems since I have them on my basement on laminate flooring. I biwired them with 12 gauge cable and installed the sourround ones with Ikea metal/concrete floorstands. The center channel sits on top of my TV. I could not be any more pleased for the results. I would have had to spend a lot more money for better results but I could not possible justify it. My neighbour has a home theater based on Athena speakers and my Fluance speakers are vastly superior. When I order mine, there was no subwoofer and I loved the low sounds from the SV10s; however, I am tempted to order their subwoofer to add a little extra even when my wife thinks I am crazy for wanting more low sound. I don't want to repeat what the other reviewers say so I can only say that my experience from beginning to end was very similar and satisfying. My system is: Toshiba 51" HX83 Harman Kardon AVR325 Fluance SV10s Fluance AVSC Fluance AVBP2 SA HD3100 I have disabled my TV speakers and listen to my system all the time and love it. I have had many friends over to watch movies and they all leave very impressed. I also connected my DVD with optical cable for optimal sound reproduction and I use A/R cables for component video. I am not an audiophile but I do have an audio system based on British JPW speakers and Harman Kardon receivers. I also have friends with very high end systems. All this is to say. Unless you have tons of money to spare you will not find much better value for money anywhere. I am Canadian and was pleased to find out that Fluance is a little Canadian company. Very clear sound on both music and movies. Ten inch woofers are great for the mid range bass that alot of smaller speaker systems are missing. They look nice and come in 2 different colors. Very good quality hardware included, gold leads and cool little spike feet for putting on carpet. I absolutely love these speaker, they are incredible speakers. Out of the box I was, frankly, a little disappointed in them. The mid range base that I wanted from the ten inch woofers just was not noticeable at all. However, after reading some more about these speakers and, more importantly, how to bi-wire them, I was as pleased as punch. These speakers MUST be bi-wired to get everything out of them. Not only do you get cleaner, quicker base, but the mids and tweeters sound so much clearer. There is a huge difference that even my less than enthusiastic wife could appreciate. In 2 channel stereo I can turn these babies up to where my poor ears are bleeding and not an ounce of distortion. True, if you have a receiver that has bass boost to the fronts, like I have on my Kenwood, you can't flood the speakers with extra bass too much or it tends to get boomy. I like to set my crossover to my sub at about 100 and let the fronts handle the other range of bass, which they do just fine. If you do decide to purchase these, go to the website and get them direct from the North American rep., they are in Canada I think. They are great to deal with and I received mine in no time.